So back in the Blizzard of 77, we got around 4feet of snow. 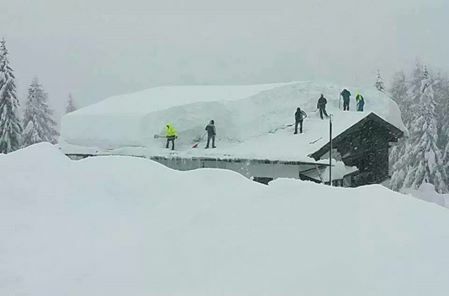 Well, now my hometown of Buffalo has set the US record with 6 feet in 24 hrs! Been in touch with family back there and its been crazy. They are used to snow but this stopped even Buffalonians from moving around. Meanwhile here in balmy NYC not a flake fell and I am still tearin it up on the hawk (30* but still dry). I lived there from '59 to '78. I miss the Summers there but not the winters. That's a crap load of snow in a short amount of time. Your hometown has been the talk around here. Some areas in the U.P. get a lot of snow, but damn! Yeah, when I was a teenager in blizzards they put up a driving ban. (illegal to drive) which means sleds and atv were legal on public roads. Its like getting to run in the halls in grade school. They are trucking snowplows all the way from here in NYC (400+mi). Here is another pic of townsfolk trying to prevent roof collapse. Last edited by 1971allchaos; 11-21-2014 at 08:44 PM.